Jamie Romeo, MD MSC1, Grigorios Papageorgiou, MSC1, Francisco da Costa, MD PHD2, Hans Sievers, MD PHD3, Ad Bogers, MD PHD1, Ismail el-Hamamsy, MD PHD4, Peter Skillington, MD PHD5, Rochelle Wynne, MD PHD5, Stefano Mastrobuoni, MD PHD6, Gebrine El Khoury, MD PHD7, Johanna Takkenberg, MD PHD1, Mostafa Mokhles, MD PHD1. 1Erasmus Medical Centre, Rotterdam, Netherlands, 2Department of Cardiac Surgery, Santa Casa de Curitiba, Pontifícia Universidade Católica do Paraná, Curitiba, Paraná, Brazil, 3Department of Cardiac and Thoracic Vascular Surgery, University of Lübeck, Lübeck, Germany, 4Cardiovascular Surgery, CHU Sainte Justine, Montreal, Canada, Montreal, QC, Canada, 5Department of Cardiothoracic Surgery, Royal Melbourne Hospital, Melbourne, Victoria, Australia, 6Department of Cardiovascular and Thoracic Surgery, Saint Luc University Clinic, Brussels, Belgium, 7Department of Cardiovascular and Thoracic Surgery, St Luc's Hospital, Catholic University of Louvain, Brussels, Belgium. Surgical options for aortic valve replacement in middle aged adults are limited and suboptimal. The Ross (pulmonary autograft) procedure is potentially a good alternative in this patient population. We aimed to describe the long term clinical and echocardiographic outcome in middle aged adults who underwent the Ross procedure.An international multicenter study was conducted including consecutive patients of 18 to 65 years who underwent the Ross procedure between 1990 and 2016. Serial echocardiographic measurements of valve function were analyzed using non-linear mixed effects modeling.During the study period, 1431 patients (74.3% males) were operated at a median age of 48.5 years (inter quartile range 42.7-54.0), of which 1048 (73.2%) had a bicuspid aortic valve. Congenital heart disease was present in 1103 (77.1%) patients. Implantation techniques were root inclusion in 355 (24.9%), root replacement in 485 (34.0%) and subcoronary implantation in 587 (41.1%). Right ventricular outflow tract reconstruction was performed with homografts in 98.8% and bioprostheses in 1.2%. In hospital mortality was 10 (0.7%). Median follow up was 9.2 years (13015 total patients years). Survival after 10 and 15 years was 89% and 79%, respectively. Freedom from allograft and autograft reintervention after 15 years were 91% and 86%, respectively. Late events were autograft endocarditis in 14 patients (0.11%/patient-year), homograft endocarditis in 11 patients (0.08%/patient-year) and stroke in 37 patients (0.3%/patient-year). Longitudinal peak gradient and regurgitation grades for both the pulmonary and aortic valve are shown in Figure 1. Long-term survival and reintervention rate in middle aged adults who underwent the Ross procedure in experienced centers are excellent. 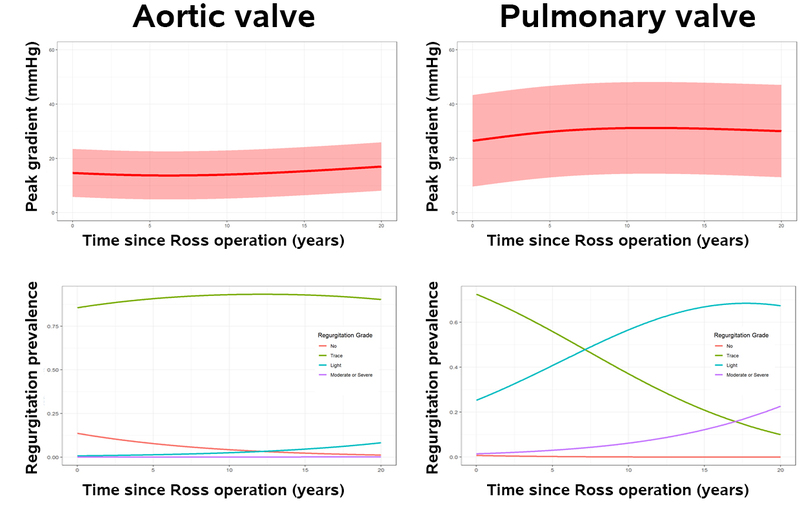 The Ross procedure should be considered in a selected group of adults in need for aortic valve replacement.